Speak to us about a great career in a friendly place in the "Best Place in the World"
Broome Day Care offers great employment opportunities. Broome has a unique lifestyle which is ideal for young people. Our Centre is a great starting place for the school leaver who would like to enter into a career in Education and enjoys working with young children. We come under the State Award Wages system. We support our staff by paying for all of their Traineeship for the; Cert III, Diploma of Children Services, and other training Educators may require.. If you would like to be part of our great team we would love to hear from you. There currently exists an opportunity for Assistant Educators (trained or untrained) to start in the New Year 2018. Keep checking back from time to time for more great opportunities! 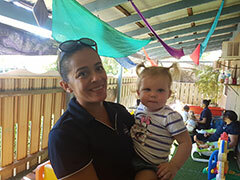 When applying for positions at Broome Daycare Centre; full time is 38 hours and part time is 25 hours per week.